However, looking at higher magnification is where you can really see the difference in images. It turns out that the pixels in the iPhone 5 are *precisely* the same size as the iPhone 4 pixels, but the iPhone 5 pixels have better color saturation with more contrast, seen particularly in the blue pixels. I did not calculate the difference in color saturation between the two iPhones, but it is pretty clear to the eye which is which. Apple claims 44% increase in color saturation and from these images, I believe them. In the normal image you can still see the quality of the color. I can’t really see the pixels being closer to the screen though. If you have trouble seeing the difference in the color saturation from the normal pic, taking a look at the microscopic, straight on one clears up any doubts as to which screen is better. Watching Twitter tonight I noticed a lot of people finding out they were not eligible until November (my girlfriend included). Read this for more info on why your at&t upgrade eligibility date is different than your neighbors. 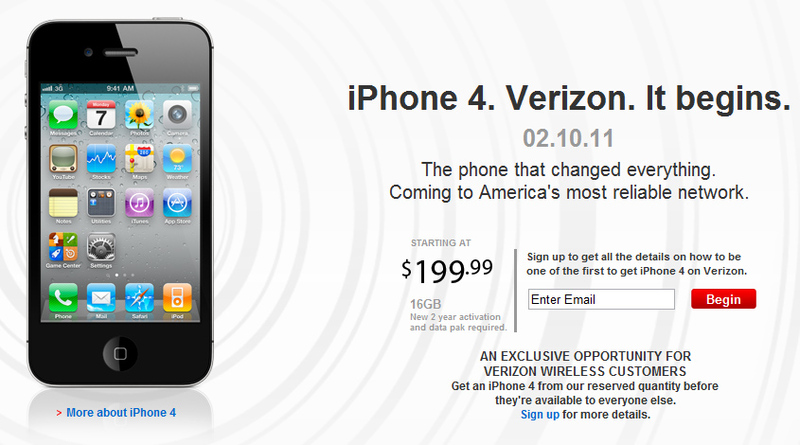 Well Verizon just announced they are going to sell the CDMA iPhone 4 starting next month, but their website already spilled the beans on the exact date, February 10th. Verizon iPhone to go on pre-sale November 9th? Probably not. TUAW is reporting that the Verizon iPhone may be available for pre-sale orders on November 9th. I know I’ve doubted all the rumors so far, but after Verizon started selling the iPad I’ve become more open minded to the idea. Still though, this doesn’t seem very Apple like. I wouldn’t imagine Apple announcing a new CDMA iPhone, especially a Verizon iPhone, without having a big press event. Remember also that all the most recent, more concrete, rumors have stated that the “vPhone” would be shipping early next year. I highly doubt Apple would allow Verizon to pre-sale the new phone so far in the future. If it’s going to happen, I believe Apple will have a big press event sometime in January to announce the phone and its release day. Any pre-sales would be, at most, 2 weeks before the product is available. TUAW later updated the post stating that this is the same day the Motorola Droid Pro is set for release, that’s what I’m putting my money on. Another great video from the guys that brought you banned iPhone 4 and iPhone 4 antenna videos.